Are you dreaming of the day you’ll be buying your first home in Vermont? Would you like a free gift of money to help you purchase that first home? The state of Vermont does not currently provide free grant money for its residents who are first time home buyers and need help with the down payment and closing costs. However, there are several Federal grants available. This is free money that shouldn’t be passed up! The grant awards can be in the thousands of dollars. It will be well worth your time to educate yourself about the grant programs that the State of Vermont provides. The agency in Vermont that provides financial and educational assistance to first time home buyers is the Vermont Housing Finance Agency. Homeownership opportunities and education are enhanced through VHFA’s financial support of and involvement with five NeighborWorks® HomeOwnership Centers located around the state. VHFA was instrumental in the start-up and provides ongoing funding of the Centers. Government Guaranteed Home Loans from VHFA offer our low-fixed rates combined with the low-down payment and less stringent credit requirements of the government guaranteed loan programs. 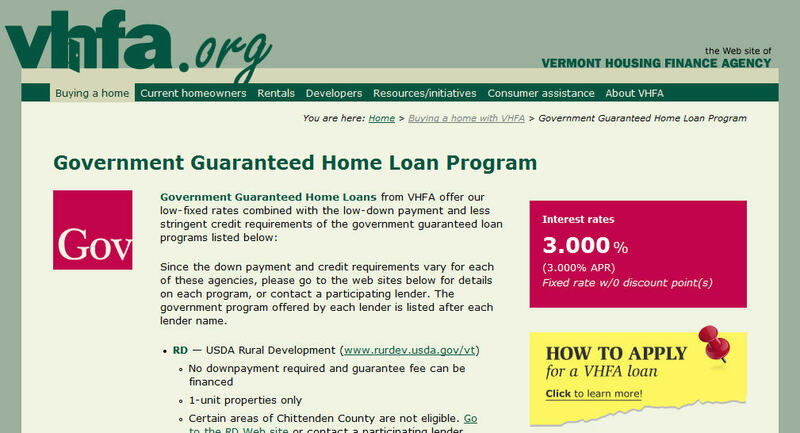 To find out more info about this program, please visit the Vermont Housing Finance Agency website page specifically describing all the programs. You can reach it going to here. 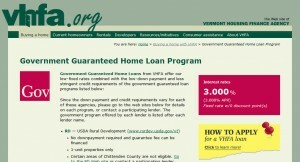 Besides the state programs, there are federal funds and grants available in Vermont through the Homes and Communities program of the United States Department of Housing and Urban Development. On their website you’ll find complete grant information, printable application forms and contact information, description of available funds, as well as many other helpful tools. Every potential first time home buyer should investigate what they have to offer. You can visit the website by going here: US Dept. of Housing and Urban Development. Also, there is a website that has a complete list of all grant programs available through the United States Federal Government: Grants.gov. You should plan to spend the required time investigating to determine how many individual grants you may qualify for. You can visit the website by going to Grants.gov and searching the site to find more opportunities for the grants. In addition to the grant programs described above, the U.S. Department of Housing and Urban Development provides home buyer assistance and grants in every state. There are multiple grant programs designed specifically for families and individuals who meet certain requirements, such as grants for people with disabilities so they can continue to live independently at home. It is worth visiting HUD’s website to see what assistance is currently available. For your convenience, simply go to here. This entry was posted in First Time Home Buyer Info and tagged down payment assistance, HUD grants, NeighborWorks®, Vermont Housing Finance Agency. Bookmark the permalink.